So you know this is unsupported, right? I believe so. To achieve this you have to add aspx pages to the FIM site. Actually I haven’t seen anywhere in the documentation that explicity says “not allowed”, but whenever someone has asked how to do this on the forum the reponse has been “can’t be done” and “not supported”. So while I’m going to show you how I did it, I can’t say at this point how the modifications will be affected by a FIM upgrade. It may be you have to re-add the pages again – we’ll see. Here’s how I got it to work – but you should know that I’ve come at this from a point of complete Sharepoint ignorance, and I have no idea how Quest/OCG got their demo working. After trying to hack some files myself, then wasting time researching “feature stapling” which proved to be no help, I got some advice from a Sharepoint-savvy collegue who suggested this general approach. The only pre-requisite here is that you’ll have to download and install Sharepoint Designer 2007. I installed it on my dev FIM server and was able to modify both the dev and prod servers from there. The first time, you must create a document library to store your aspx files. 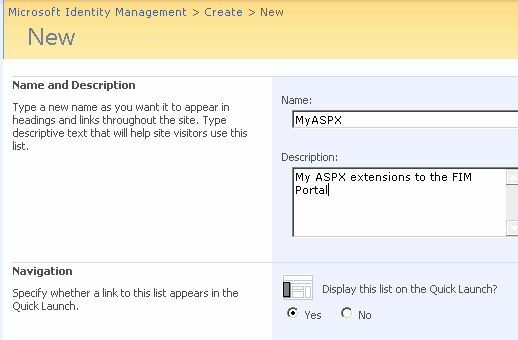 Logon to the FIM Portal as an account with Sharepoint Administration permissions. In the top-right corner, click Site Actions and then Site Settings. Note if you don’t see “Site Actions” then you don’t have the appropriate Sharepoint permissions. 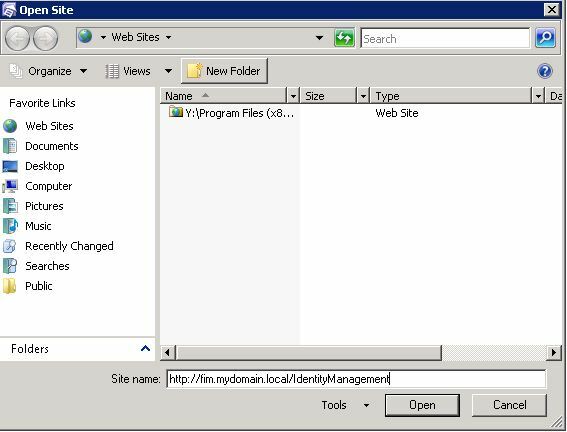 Under Site Actions click Create and choose “Web Part Page”. At the bottom of the next form you should see that Document Library is “None Available”. Click the Document Library link to create one. Give the library a name and description. 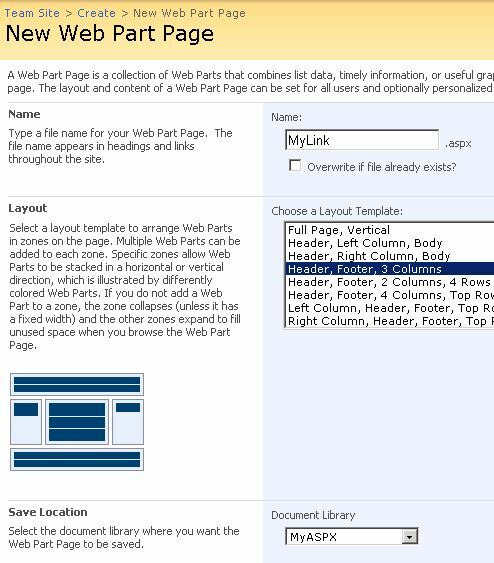 Go back to the Site Actions -> Create page and again click “Web Part Page”. Give the page a suitable name. It doesn’t matter what layout we pick as we’re actually going to over-write all the aspx it generates. Save it to your new library. The page will come up in edit mode. Just click Exit Edit Mode to close it. Now we’re going to replace the default aspx with new content that simply opens our external site in an iframe. 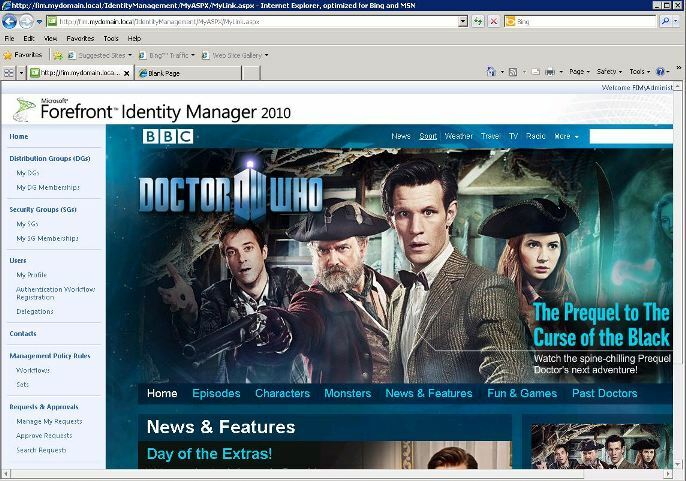 Open Sharepoint Designer 2007. Click File -> Open Site and then enter the URL of your FIM Portal. If all has worked so far you should see your Document Library, and inside you will find your new ASPX file. Check the file out then open it as Text. 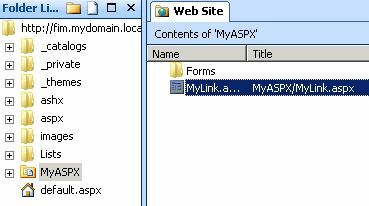 Replace the contents of the aspx file (see code below) then save and check back in the file. Note that I always see this error the first time I access the page, and then it goes away. Not sure if I should be worried or not! I’m not going to go into details about how to do this here, but you need to look at Home Page Resources and/or Navigation Bar Resources. Posted by Carol on Wednesday, May 4, 2011, at 7:41 pm. Filed under FIM 2010, Sharepoint. Follow any responses to this post with its comments RSS feed. Both comments and trackbacks are currently closed. I demand a blog post on this! Sounds very interesting. There’s things we can do with extensibility to solve our own problems, and I believe these are things we should not prioritize bugs for. there are things that only the FIM team can do to enable us to solve our own problems through extensibility, and I believe some changes to the portal would go a long way here. The fact that the portal is mostly a client of the same web service as the rest of us is pretty cool. It’d be even cooler if we had the ability to do deep customization to that portal. Very cool stuff, thanks very much for this. How can I get a window to popup in the portal versus a page within a page?